In the spirit of FABLES: 1001 NIGHTS OF SNOWFALL and FABLES: WEREWOLVES OF THE HEARTLAND comes the first ever original graphic novel from the pages of #1 New York Times bestselling writer Bill Willinghams FAIREST.<br />FAIREST has explored the secret histories of the most stunning beauties in Fabletown: Cinderella, Snow White, Briar Rose, Rapunzel, and the list goes on and on. In FAIREST IN ALL THE LAND, the best names in comics take their turns fleshing out the pasts of the loveliest Fables in existence. 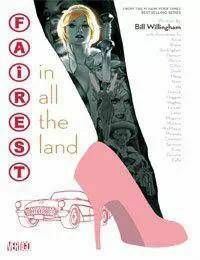 For all those wanting to dive into FAIREST or FABLES, this original graphic novel is a fantastic entry point, as well as a great new chapter for those that have been following Bill Willinghams fairy tale epic for years.